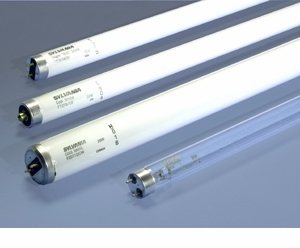 Case quantity is 24 Sylvania 20W T12 Blacklight Fluorescent Light Bulb - F20T12/350BL/ECO - Description: 20W T12 preheat fluorescent lamp, Blacklight phosphor (356 nm). Average Rated Life (hr) 9000, Base Medium Bipin Bulb T12, Manufacture Sylvania. Sylvania 20W T12 Blacklight Fluorescent Light Bulb - F20T12/350BL/ECO - Description: 20W T12 preheat fluorescent lamp, Blacklight phosphor (356 nm). Average Rated Life (hr) 9000, Base Medium Bipin Bulb T12, Manufacture Sylvania.